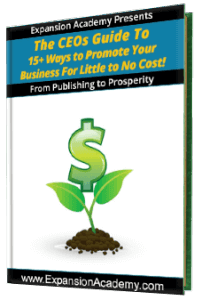 The CEOs Guide to 15+ Ways To Promote Your Business For Little Cost! Welcome to Expansion Academy and our exclusive training guide – The CEOs Guide to 15+ Ways To Promote Your Business For Little Cost! As you probably already know, advertising costs can get expensive very quickly. Although you are probably always looking for ways to promote your business, you probably don’t want to go in the poor house while doing it. Luckily, it’s possible to learn how to promote your business for no or little cost. These are a few tips and ideas that can help you get started with bringing in traffic and business without having to spend a fortune.